Question: What part of our mind goes to the Pure Land? Answer: What we know for sure is that birth in the Pure Land takes place after physical death. This is what the Masters of our tradition clearly said, so we accept it. At death, what we call ‘mind stream’ leaves the physical body and instead of passing through bardo (intermediary state) and then to other states of existence, it goes directly to the Pure Land where Enlightenment happens immediately. At that very moment, the delusions of our ‘mind stream’ are naturally melt like ice meeting fire, and our true enlightened nature will appear. So, we may say that we go to the Pure Land as we are, but once born there, in the safe and enlightened realm of Amida, ‘we’ transform into something completely different, that is, fully Enlightened Buddhas. But all these things are inconceivable and beyond conceptual understanding, so I cannot enter into further analysis. Some aspects are imposibile to understand at the level we are now as unenlightened beings. 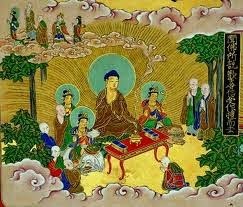 Now all we need to do is to simply entrust to Amida. Jodo Shinshu is the path of simple faith, not of profound understanding in this life of the ultimate nature of mind.